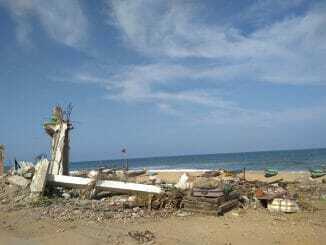 As Chennai stares at an impending water crisis due to the failure of monsoons and the decline in ground water and reservoir levels, the city’s residents must brace themselves for a tough summer. Currently, Metro Water is able to meet only half of the city’s daily demand of 850 MLD, and that too on alternate days. Residents have already begun to feel the pinch, particularly in the western and southern parts of the city. 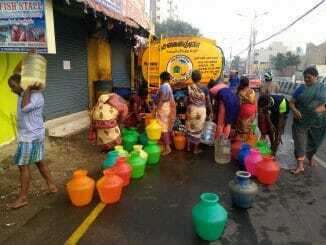 In this situation, Chennaiites need to adopt innovative methods to conserve and reuse water. Though the city had embraced rainwater harvesting in the mid 2000s, monsoon failure has put a dampener on this method of conservation. A growing trend in recent times is the recycling of greywater for household purposes, that will significantly cut down the daily water demand. Greywater recycling can be implemented easily, without high capital investment, and hence can be adopted by a large section of Chennaiites. Greywater is gently-used water from a household’s bath, sink and washing machine. It does not include water from toilets. There are no traces of faecal matter in greywater. The water that is usually used for washing vessels and clothes, and for bathing, constitute a large quantity of the greywater generated. An average resident uses around 120 litres of water per day, of which 70% ends up as recyclable greywater. Tapping into this source and reusing it for other purposes will greatly reduce the demand for water. Where can you use recycled greywater? It can be used to water plants in the garden, directed to toilet flushes, or used to wash cars and bikes. It is not advisable to use recycled greywater for cooking or drinking. Greywater recycling can greatly reduce the burden on the city’s sewage system, since the bulk of the wastewater from households would get recycled internally. It will also reduce your water usage, and help you save on the cost of procuring water. At times of acute water crisis, recycling greywater will help households sustain themselves on a lower level of water availability. The recycled water can also be percolated underground, to recharge the groundwater table. “We have saved a lot of water over the years after we set up greywater recycling in our household. We have lush plants growing from the recycled greywater in the garden. The water bills have reduced and we have managed to cut down on wastage of water significantly,” says Shanta S of Nanganallur, who has been recycling greywater for the past two years. Greywater can be recycled through a few different methods, all of which involve its diversion from the normal sewage line and preventing it from mixing with blackwater, that is, water from toilets. Greywater has to go through a filtration process before reuse, as water from the kitchen sink may contain organic matter, and water from the bath and laundry will contain residue of soap and detergent. Depending on the space available, a suitable method can be adopted. One method is to add a diversion valve to the plumbing system at points in the sink and the bath. The diverted greywater is then collected in a tank for filtration. The water is filtered by adding bleach or a nano solution, and then pumped into an overhead tank. From the overheard tank, the water is once again used for household purposes like toilet flushing or for watering plants in the garden. For households and apartments that have open space to spare, greywater can be recycled by a plant-based method. A trench is dug on the ground, and lined with a layer of porous plastic sheet for filtration. The plastic sheet is then layered with gravel and sand. On this sand, water-loving plants such as Canna Indica are planted with reasonable exposure to sunlight. For a 10-12 unit apartment, the plant bed would need to be about 15 feet along. The greywater generated in households is then diverted to the plant bed. The plants act as a filter and absorb the organics in the greywater. The water then percolates through the layer of sand and gravel, and is collected in the trench. The water can then either be diverted to an overhead tank or be used to recharge dug wells or the ground water table. Use of organic soaps and detergents, that leave lesser residue, will also aid greywater filtration and purification. Costs depend on the method of recycling. The plant-based system requires space within the premises, and an elaborate set up. 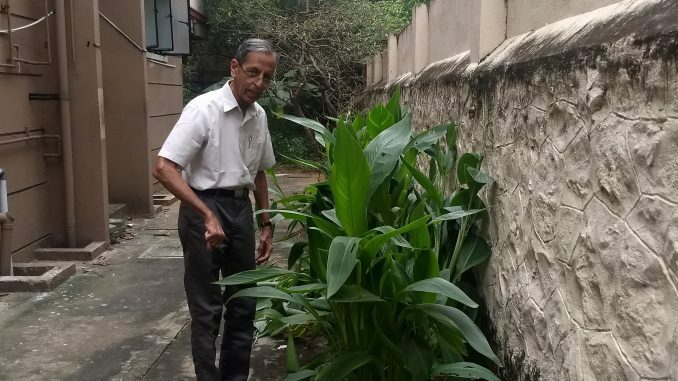 K Sakthivel of Rainstock System, a firm that helps set up greywater recycling units, says that a mid-sized apartment complex with 10-12 households, that produces 10,000 litres of greywater per day, will have to make a capital investment between Rs 3-4 lakhs to get the plant-based system in place. Alternatively, for the direct rerouting of greywater through a sump tank and treating it with bleach, the average household will need to make a one-time investment of Rs 20,000 for 1000 litres of greywater. The recurring cost will be that of the bleach or nano solution purchased for daily use. Paucity of resources is soon to be an integral part of urban life with growing population and climate change. As with the success of rainwater harvesting, greywater recycling must be promoted by the state to reduce the stress on water resources. On olden days our waste water from kitchen and bathrooms used to be let out at every household’s back yard. They used to plant plantain trees, coconut trees and various vegetable plants. Water used to get absorbed by the earth, recharging ground water.The normal evaporation was happening from this water which saves evaporation from deep underwater aquifers thus preserving groundwater and preventing leaching of chemicals upwards during the process of evaporation.The government is run by excellent and highly potential people who should look into these means to preserve water which is a natural resource under threat.